Over two perfect days for running, the Katie Jenkins Invitational provided prime conditions for a last minute tune-up before counties and many personal records for younger runners. The B-CC boys� and girls� distance showed their depth and talent this weekend, as did Clarksburg�s sprint squads. The 4x800m relay proved to be easy victories for both B-CC boys� and Northwest girls,� the only elite teams in the county to run their best. Though the Northwest�s girls ran virtually uncontested, the B-CC and Northwest boys� squads battled for first for the majority of the race. The next day, the B-CC boys again proved their dominance, sweeping the 1600m run with Kyle Short, Dylan Straughan, Alex Prevost and Walter Beller-Morales taking the top four places. The girls 3200m also proved to be an exciting race between Paige Donnelly of B-CC and Sarah Britton of Richard Montgomery. The two established an early lead over the rest of the pack and entered the last 100 meters neck and neck, sprinting to the finish. However, the pair ran into a Sherwood runner just entering her last lap, breaking Donnelly�s stride and allowing Britton to seal a victory in a time of 12:14. Donnelly came back the next day to place fifth in the 1600m run and fourth in the 800m run. Teammate Addie Tousley placed first in the 1600m run by passing Northwest�s Kathy Aherne in the last lap to cruise to the finish line. Tousley came back to place second in the 800m run to Blair�s Johanna Grestchel, who placed first in a blazing time of 2:18. Avery Graham once again proved his talent, finishing first in the 100m dash in a time of 11.1 and tied the fastest 200m time of the day of 22.7. Though Graham did not run in the finals, he placed first in the shot put and watched teammate Rob Thompson take second. Clarksburg�s Mark Small dominated the 200m dash finals, finishing well ahead of his competitors after placing third in the 100m dash. Small came back to finish third in the 400m dash while fellow Coyote, Myles Daughtry finished in first. The Clarksburg boys� showed even more depth in the hurdles, as Michael Leaman, Petros Bein and Arnould Nikamdjeu all ran in the final heat of the 300m hurdles and finished first, fourth and sixth overall, respectively. Though Richard Montgomery�s Tyler Jackson dominated the 110 hurdles, Bein and teammate Morgan Mott finished second and third. The Clarksburg girls� also showed their strength with Turquoia Johnson, Charnay Ryland and Kayla Hunter all qualifying for the finals in the 100m dash. Johnson, Clarksburg�s female equivalent of Graham, finished second in both the 100m dash and the shot put. Ryland and Courtney Clark both placed second in the 400m dash and 200m dash, respectively. The 8x200m relay would serve as the ultimate test for the Clarksburg sprint squads. 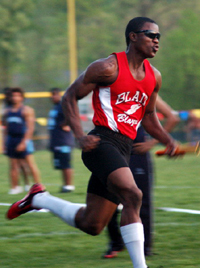 This relay would be the only event the Blair boys� and girls� sprint teams entered in. The Blair girls dominated their heat, but with sloppy handoffs, their time suffered. In the next heat, Richard Montgomery led nearly the entire race before Clarksburg�s anchor ran a blazing leg, garnering a heat victory. The two teams anxiously awaited their official times�Blair finishing in 3:46.2, Clarksburg in 3:46.7. The same would hold true for the Blair boys� who similarly dominated their heat, only to watch Clarksburg do the same. The Blazers finished just 0.9 seconds ahead of Clarksburg in a time of 3:04.0, tying Good Counsel�s winning time from last year. True - not enough information. What about some of the lesser known athletes and schools? You mentioned the Clarksburg HS girl sprinters in the 100m dash but you should at least mention the 100m dash winner, Sherwood's Sydne Gant. What about the quadrathalon though. Yeah B-CC fried in the quadrathalon. This is her take on the meet. If you want to see a list of all of the winners, check the results. I'd like to invite Anonymous to cover the next meet for mocorunning. Email me and I will set you up. The point of a recap is to give readers an idea of the highlights of the meet and what some races were like. If every race of the meet was mentioned, the article would be extremely long and incredibly boring. For the teams that weren't at Katie Jenkins, this is the best way to hear about the action in some of the most exciting races and to get a general understanding of the general outcome of the meet. Yea dat meet was good....and Rockville was alos out there doin there thing! I'm not putting anyone down it's just that there are athletes who achieved personal bests at this meet even though their school as a whole did not do well. We never hear about those athletes. It would be nice to hear a little something from each school.